Harmonix, creators of the popular Rock Band and Guitar Hero series of music-themed video games, is stepping away from consoles and the PC for its next offering. 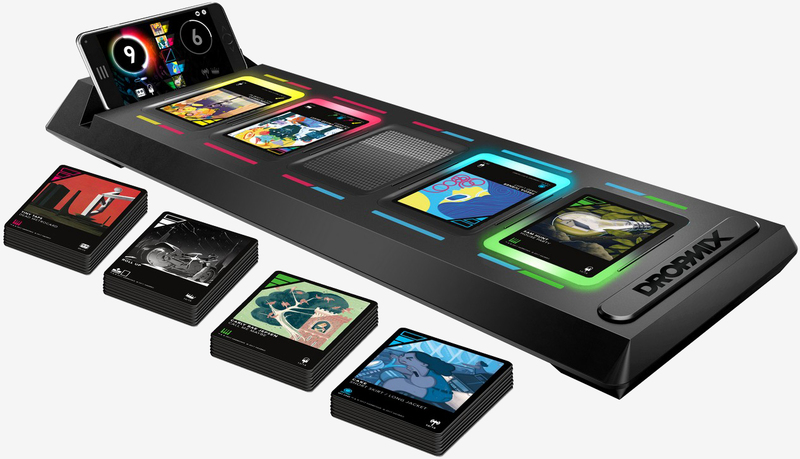 Developed in collaboration with toy maker Hasbro, Dropmix is a new music-based card game in which players will place cards on an electronic game. The board, which gets connected via NFC to your Android or iOS device, sends data about each card to the game’s accompanying mobile app. Individual cards are responsible for adding things like bass, beat, loops or vocals. As a new card enters play, its characteristics will be mixed into the “song” as part of the “game” in which players compete against each other. Score (or progress) seems to be based on a point system in which cards with higher point values can boot other, lower-value cards off the board. There’s also a free-play mode in which you can just lay down cards for the heck of it just to see what sort of mixes you can come up with. Engadget’s Kris Naudus recently spent some time with the game and had high praise for the cards’ illustrations, noting that they’re nice enough that he found himself just staring at them while playing. As for the game itself, Naudus said it’s’ the interesting and addictive game mechanics that will ultimately keep this new game going. Dropmix will arrive in September with 60 cards across multiple musical genres priced at $99.99. As with other Harmonix games, you’ll also be able to buy “DLC” (card) packs priced at $5 and $15 each.